and even if you don’t know how to sell. 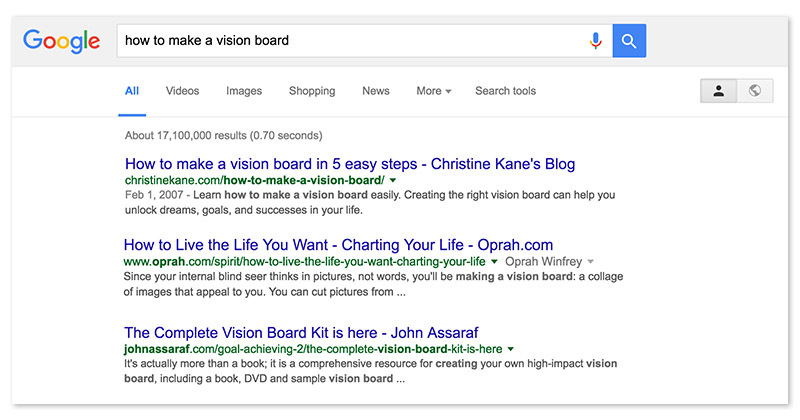 Remember right after you made your first Vision Board? How you said to yourself, “I want my friends to do this too!” Remember that? 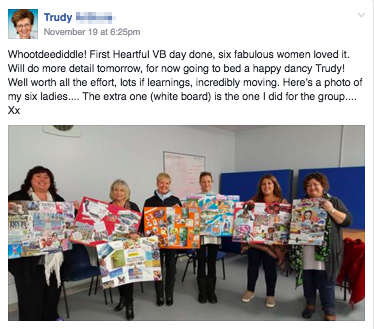 Maybe you were even so inspired that you rallied a few pals together and got them to make Vision Boards with you! Well, what if you could take this same passion and enthusiasm and turn it into an extra $750 (or more) on the side every few months? That’s exactly what I want to show you how to do. 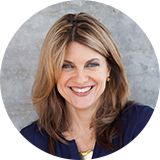 Hi, I’m Christine Kane, President & Founder of a really cool company called Uplevel You. I’m also the author of The Complete Guide to Vision Boards, an eBook that began as a simple passion project and has now been downloaded by over 45,000 people. What could I possibly do to help people live their dreams? 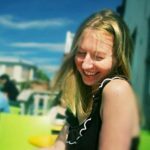 I know I’m meant to do something purpose-driven, but how do I discover it? Who would be interested in what I have to say? How can I discover my purpose if I never get opportunities to try new things? People tell me I’m a leader, but how can I really use my talent? Brain Traps are those hidden patterns that stop us from listening to our hearts and taking action on our great ideas. How many of these apply to you? How many of these brain traps do you have? And how do you typically deal with them? For most of us, we don’t see the trap. Instead, we believe brain traps are truth. That’s how we end up giving up on our ideas! That’s why we settle for things we don’t really want! It’s how we’ve been taught! You go to a networking meeting – but where does that lead? You go to a big motivational conference – and you’re all fired up … but now what? How does any of this turn you into a leader, or someone who is actually doing something that helps people change their lives? It doesn’t. It’s just a lot of extra stuff that wastes time while no one (including yourself) gets a single transformative result. Here’s the thing. People don’t sign up just to have someone tell them what to do when they’re in a jam. They sign up for workshops and trainings that get them results. That’s why, when I designed and tested VisionBoardPro, I created a teachable and useable framework. This is the exact framework that got my students life-changing results. Using my template, you don’t have to think about complex program lay-outs, or complicated lesson plans. You can plug your teaching style right into my proven content. Look, it’s not just about the amazing material you teach. These days, you need a specific plan for how you will market or sell anything. I’ve been running my own businesses for over 20 years. Every last thing I’ve learned about marketing events has been meticulously laid out in Vision Board Pro. You don’t have to reinvent the wheel. You do not have to face the all-too-common fear of no one showing up. You have a proven plan, and do-able action steps to take. 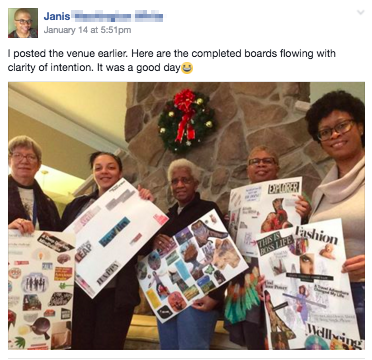 Your Vision Board workshops sell out. You’re making money, and you know exactly what to do, how to do it, and when. Your confidence soars. You get to experience your own true power to lead and also to enroll people in your vision for them. Your credibility grows. People are telling friends and loved ones that you’ve changed their lives. You finally see what it means to live your purpose. How would it feel getting paid $750 (or more) to create something that brings real value to other people? How would it feel to have extra cash to buy Christmas gifts for your family this year? What would it be like to have people genuinely thank you for changing their lives? Or to get calls asking you about your next workshop? Or to be the envy of your friends and siblings? Or to acquire permanent ongoing clients? Or to finally stop wondering whether or not you’re living your why? Here’s how it works – we’ll spend 4 weeks together. You’ll receive your step-by-step module and training each week. Prepare and organize your workshop gameplan with know-how, elegance and inner peace. 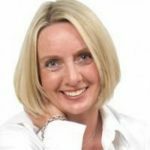 Pre-written, done-for-you templates, tools and spreadsheets (the exact ones we use at my business) you can just plug & play to make the planning process smooth and simple. Where to find free workshop spaces that cost next to nothing and reduce your risk to zero. How to choose the optimal date and day of the week for your workshop. The Email Vault: The complete arsenal of tested, proven, pre-written emails you will need to share your workshop with the world. The Vision Sheet™ Engagement Plan – How to position your credibility and get people engaged and excited before the workshop arrives. Proven focus exercises that will optimize the Vision Board experience for each participant. My high-performance workshop timing planner to keep the group focus strong – and the energy high. My own arsenal of tools, techniques, strategies and even supplements that have optimized my performance over years of workshops, events, retreats and speaking engagements. Habits and practices for managing your power, emotions and even your body for attracting greater future opportunities, creativity and results in your life. The “Send a Friend!” Referral System – to keep your workshops full multiple times each year, without having to create extra marketing. This was awesome! I loved that I got an actual timeline of when to send emails, plus what to say. The Five Step Road Map tool was genius when it came to planning the event. 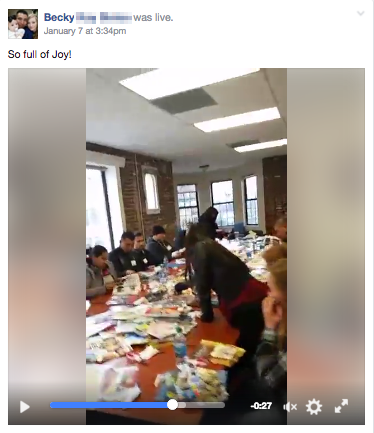 And…my first Vision Board Workshop, totally sold out! I had 17 participants! I made over $600 net for the workshop. I am now hosting a second workshop later this month! Never before released trouble-shooting Q&A that addresses the rarely-discussed challenges of doing any kind of live events or workshops. What do you do if someone cancels last-minute? What if your cousin’s roommate shows up with mimosas and tries to turn your workshop into a party? (Yes, this has happened.) What if someone gets pissed off that you’re charging money? What if someone is aggressive at the workshop? What are some of the bizarre requests you might get (and how to handle them)? 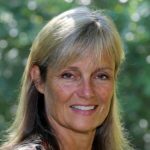 This is the stuff that no one ever tells you about or preps you for, and this is where I’ll give you specific scripts, as well as techniques for managing your mindset in these oh-so tender scenarios that don’t happen often – but when they do, you just want to be prepared, that’s all. ARE YOU A LIFE COACH? DO YOU NEED CLIENTS? If you are a life coach, and you’re wondering how to get new clients, then VisionBoardPro is not just an income-stream! 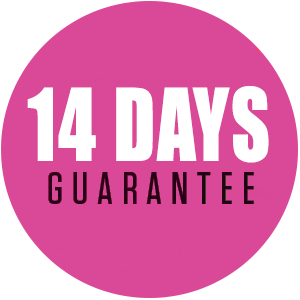 It’s a guaranteed lead generator for new clients. Offering a workshop, seminar or event is the single best way to generate new leads to fill your practice. I’ve now coached and trained hundreds of life coaches, which is why I’ve included this special bonus for life-coaches who want to use the Vision Board Workshop as a lead generator to get new clients. 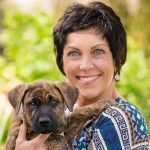 This will teach laser-focused (and totally authentic) techniques that will turn your workshop participants into wannabe clients – as well as the exact scripts for following up and enrolling them! This is a fear that stops a lot of people who could be great teachers. Yes, of course, experience will make you get better and better as you go. But confidence begins just by knowing your natural teaching style. Did you know that everyone has a natural style for how they teach – and that you can make it much harder for yourself if you’re fighting that style? 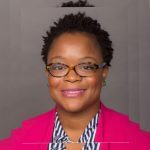 The Uplevel Teaching Styles Model and Self Audit will shine a light on your unique teaching style – as well as give you specific strategies for optimizing your performance and preparation before not just your Vision Board Workshops. You can use it for any teaching or presenting you do. This is NOT about what you teach or even the methodology of your content. This is about discovering and owning your natural competencies. This is a bonus that will get you clear and help you build your confidence and competence no matter what level of experience you have in front of the room or on stage. 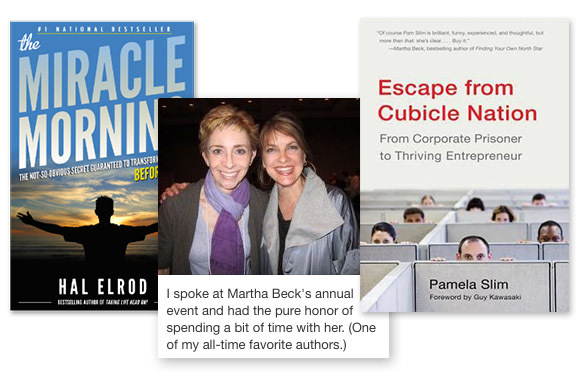 The Wealth Accelerator Pack consists of two trainings on wealth mindsets. In the first training (audio) you’ll learn how to recognize some of the seemingly small ways we trap ourselves in negative money conversations – and what to do to change that pattern. In the second training (video) you’ll see me teaching LIVE on the keys to building your own wealth as you build your new small business. 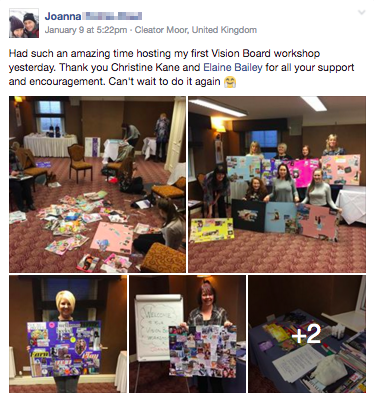 When I joined Vision Board Pro I was already running regular Vision Board workshops but wanted to make sure my workshops were as good as they could be using Christine’s guidance. The main takeaway for me was that my systems were not as good as they could be – or not even there at all! Vision Board Pro really helped me with the nuts and bolts of marketing and running my workshops. I also realised that my pricing structure was all wrong. So, I followed Christine’s advice to the letter in Vision Board Pro. And I was able to put my systems in place and raise my prices, whilst continuing to fill workshops. 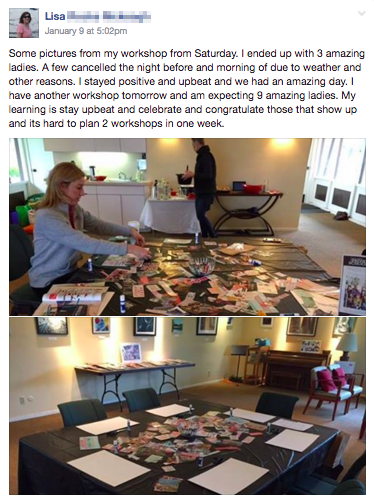 In fact, my last three Vision Board workshops have sold out! 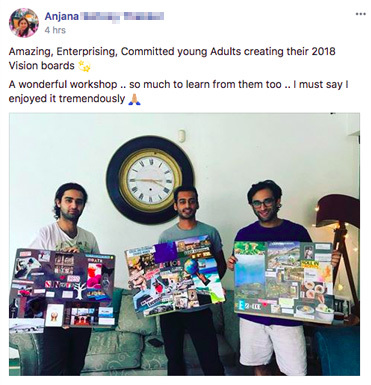 I highly recommend Vision Board Pro for those who are getting started with running vision board workshops and for those who would like to make sure that the workshops they provide are as good as they can be. Additionally, I’ve connected with Vision Board facilitators all across the globe and this has been incredibly powerful for my work. The trainings and group coaching calls are not just specific to Vision Board workshops, but can be used as a tool for success in many business applications. Christine lays out the exact language for emails to be sent out, and the timing is right on. I followed her instructions exactly. 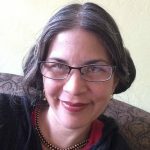 When my workshop date was three weeks out, I sent the first email. 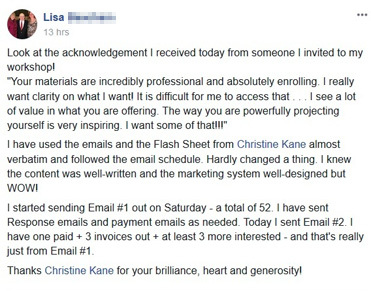 I was nervous but when that first person paid via Paypal for the workshop, I was overjoyed…wow, this really works! On the day of the event, I was so excited! 10 people had signed up and paid, and it was a perfect number. 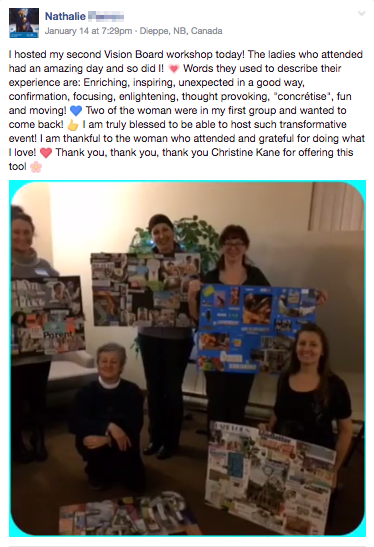 The results were beyond my expectations and the participants Vision Boards were lovely. I will now be offering a Vision Board Workshop every quarter. I have found my highest calling, thank you Christine! 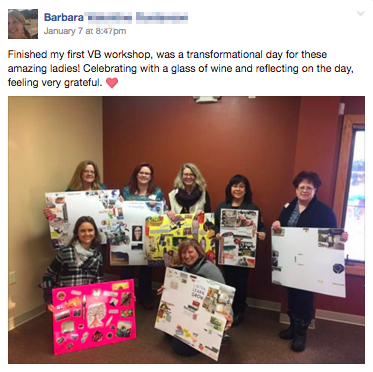 Vision Board Pro helped me design, launch, market and then lead, not just a workshop, but a truly transformational experience for my participants. 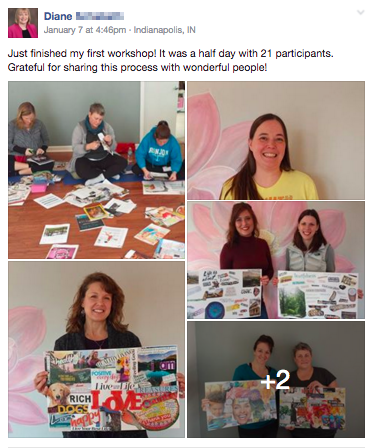 At my first workshop, I had 19 incredibly engaged, creative and interesting women! They were so into the process, shared eagerly with one another, and by the end were full of emotion, dreams and hope. I’m receiving extremely positive feedback from the day. Plus, I got two new private clients as a result, AND have already booked my next workshop! Because of Vision Board Pro I felt in-the-zone, confident and ready to lead such a day. I received a ton of value from the program and recouped almost triple my investment from just one workshop. Even though I’ve facilitated events before, I still have fears about being on stage. Christine’s format was just what I needed to overcome my fears. It showed me how to just be myself and follow the steps exactly. On my first workshop, I charged $125 a person and made $875 total, which covered my costs of the program and more! My second workshop is coming up in a few months! Vision Board Pro was full of valuable materials, tips and tactics. But what I found most valuable was that it created personal inner-growth, it pushed me through the “scary parts” that have stopped me in my many past business ventures. It got me out of my comfort zone in a clear steady way that helped me gain certainty and self-confidence to keep going. And I did it! 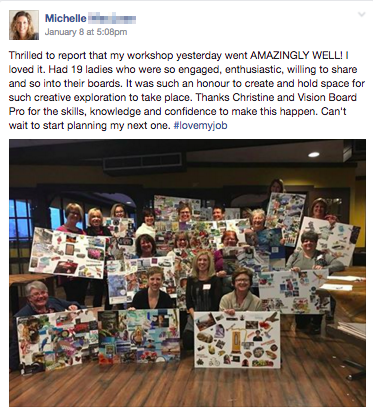 In only one month I gave my first Vision Board Workshop – and instantly made 75% of what I paid for Vision Board Pro! Then, just one month later, I hosted my second workshop! 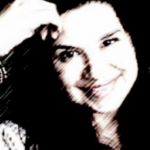 Now I’m excited to see what my future holds…as a workshops facilitator and beyond. 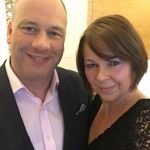 I’m a speaker and business coach – and I knew Vision Board Pro would be extremely valuable for the personal development work I do. I’ve done a few vision boards years ago, and thought it was fun. But, never have done the clarity work like Christine teaches which makes vision boards so much more real and worthwhile. I followed Christine’s lessons exactly. When she said ‘find a room’ I found one. When she said ‘pick a date’ I picked one. The FB group is great support and accountability. I gave one workshop in person and charged $67 per person. And, my next workshop will be in-person – plus I’m also offering it virtually – so I already have sign ups from around the world! 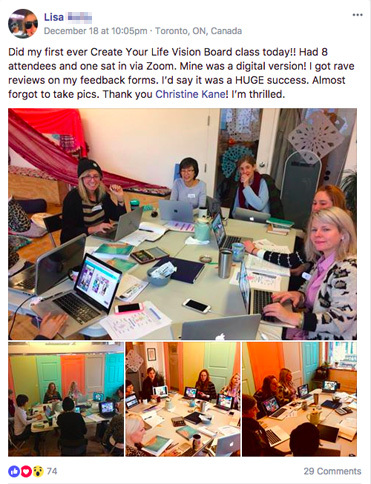 When Christine announced that she was giving a preview on how to give a Vision Board workshop I signed up. I now have my own Vision Board business! I followed the plan to a T and it worked! At my very first workshop, the 8 participants were ready and committed; they were in charge and didn’t even want to stop for lunch…they ate while creating ! The participants exchanged images, they laughed, cried, had aha moments but most of all they were bonding and want to meet again in one year! The energy that was in the room was palpable! They all commented on it. It was a success! 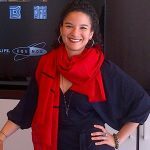 I’ve been working in a job and an industry that I have not enjoyed for the past three years and have really struggled to see how I can add value in any meaningful way. I have literally heard myself saying “its a job, I can do this for another 10 years. It brings in the money to let us have holidays etc”. Inside I have been slowly dying. 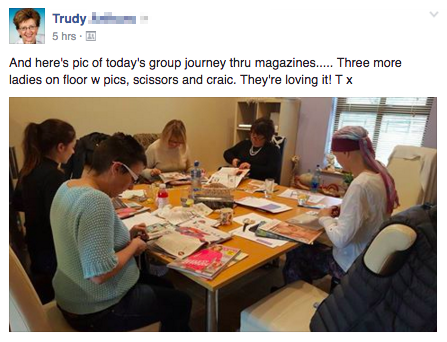 During my first Vision Board workshop I found myself observing all the ladies studiously working on their visions boards and realised I had the biggest grin on my face. I sent a text to my husband that read “I literally feel like my soul is soaring!”. 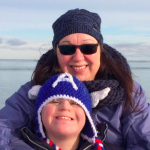 Going through the programme has helped me personally to reconnect with my spiritual beliefs and my purpose and I have become so engaged and excited about what my future holds and how I can contribute and help others. VisionBoardPro is a proven system. It’s time-tested. I created it at first for myself. Then I taught these techniques to a handful of high-paying clients. They got results. And, I’ve used their feedback and made it even better. The materials in VisionBoardPro are based on 20-years of building my own two businesses, 7-years of rolling up my sleeves working with clients in person and on the phone, updating modules yearly to match online trends – and tossing out anything that didn’t get stellar results. In a time when flash-in-the-pan internet marketers enter the scene, take your money, and scram… the programs I create have lasted. This is why my blog is still around after 10 years. This is why my business still serves hundreds of raving clients. It’s why I get love letters from students. And it’s why I stand squarely behind this program. Try the course and if you don’t love it and know this is something you want to do, then write to my team at info@uplevelyou.com within 14 days, Tell them what you’ve tried. And we’ll refund every penny you spent on the program. 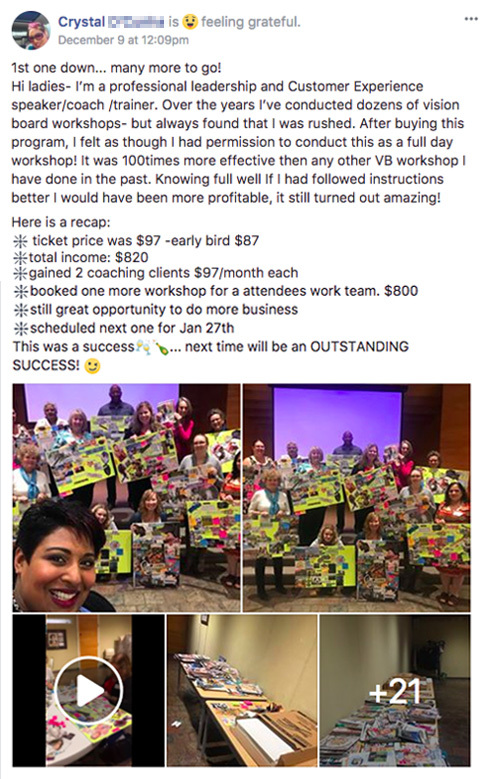 I had nine people at my first Vision Board Workshop and it made $675! I’ve gotten wonderful feedback from a few of the participants on how they are already seeing changes in their lives and continuing to have new insights day to day. I discovered that I’m the Analyst Teaching Style (in the Teaching Styles Audit) so I need a set structure and what to say for any talk I’ve had to give. I definitely followed the steps Christine had in the modules, listened to all videos and downloaded everything and printed them off – they are great! It was lovely to watch the participants go through the worksheets Christine provided – you could see them pause, think they’d finished then come up with some more writing. I had one lady writing on both sides of the sheets like a long letter style. I felt quite privileged to read some of them that came back, quite private stuff! At my first workshop, I made close to $400 – and have since heard from people telling me how they feel more focused and in action! Vision Board Pro was one of the best courses I’ve taken online. It was simple to implement, the videos were perfect length, tone (this is a BIG thing for me), the pdf’s were AMAZING, not to mention the email templates, and marketing email campaign schedule. At my first workshop, my attendees were thoroughly impressed. It’s almost like the were awakened. It was incredible to witnessed the transformation. I will now be hosting this workshop monthly! I learned so, so much more than I expected in Vision Board Pro. Simple things, like saying a date out loud, asking people to be accountable and holding firm on getting paid have made a huge difference in my business. Then, more complex things like learning the email sequence, follow through strategies and getting referrals have been even more significant. 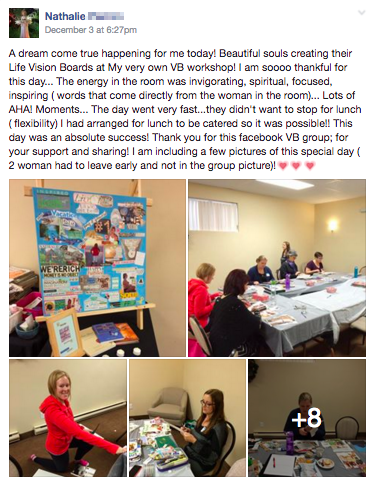 And my Vision Board Workshop was the easiest workshop to fill that I have ever done. I charged $150 per person and not one person even flinched at the price! Every single participant in that workshop left with both a meaningful experience and deep insights about their vision for their life. But here’s the biggest result: I used some of the money I made to have a new logo created for my business! 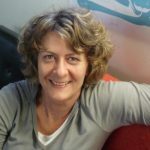 Being Dutch I feel that I can’t express myself the way I want in English, and I like Christine and her style of communication. And Vision Board Pro gave me the steps to set up and market my events – (also my other events!) – in a professional way. For me that was the biggest thing. 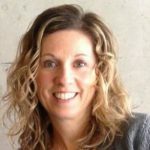 Christine, you have an awesome, inspiring and clear way of teaching your message! I’m stepping it up from a hobby to a business! I tried to host and lead a retreat that totally bombed. (People dropped out at the last minute, and all kinds of stuff I hadn’t even prepared for!) 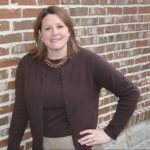 Then, I worked with Christine at Uplevel, and learned how to market and plan and own my power as a leader. 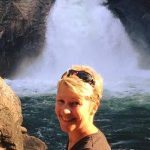 When I offered my next week long international retreat, I only had one spot open three months in advance! It felt tremendous! 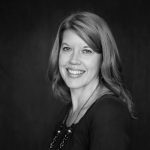 I’d been thinking about branching out into creative coaching and had been considering different lead generators I could put out there. 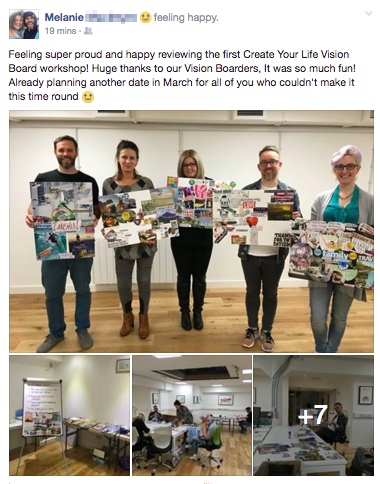 I enjoy running workshops and I had a couple of ideas – one was to try a Vision Board workshop. Vision Board Pro was perfect. I loved having a ‘done for you’ plan. 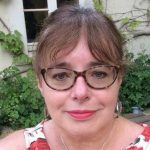 I have a fair amount of experience in designing and running events and I was delighted that Christine’s approach covered some areas that I wouldn’t have paid such attention to. My first workshop was a success! Participants loved the insights that they came up with just through giving themselves the time and space to think about who they want to be, what they want to do and what they want to have in their lives. I got amazing feedback and comments and emails. Vision Board Pro gave me EVERYTHING I needed to lead an amazing and transformative workshop. I’ve done vision board workshops before but this time I showed up differently, as a leader who guided the participants deeper in the process. 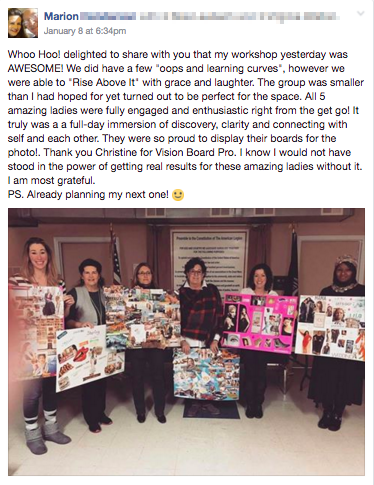 I followed the Vision Board Pro plan exactly and 14 people came. This was huge for me. At $67 per person, I made $938 total at my first workshop. AND I signed up three new clients from that day ($1,500 additional revenue). Also, one of the workshop participants introduced me to her boss, the CAO (Chief Academic Officer), and I may be offering these workshops in the workplace! At Uplevel YOU, we don’t teach or believe in magic pills. We teach and believe in living, serving and earning at a much higher level than most people think is possible. With that said, Upleveling your Business and your Life is about your personal choice, inner growth, and taking lots of action. So, here’s the deal. We are legally required to remind you that we do not guarantee your results, income or outcomes if you use our tools, templates, strategies or secrets. We are here to deliver high levels of training and content that will hopefully serve you for years to come. Will you get the same results as other people who have worked with us? We have no idea. (We don’t even know you!) So, it depends on you, your decisions, your actions and your level of personal accountability. Got it? Good! Furthermore, nothing on this page or any of our websites is meant to guarantee results – and we do not offer legal, tax, financial or any other professional advice. The numbers on this page and on any of our websites are illustrative only – and should not be considered exact, actual or a guarantee of your future earnings. Thank you for visiting! Now, go forth and Uplevel the planet with your cool self!